This is the deck I’m currently experimenting with I wanted to test out how Warriors newly acquired access to Charred Cowl of the Damned would effect them. I decided to look at working with an Resource Renewal/Manipulation build using Tombstone Beacon, and Jeweller’s Dream for swarming Undead potential. Really I chose Logan as the hero because I am most comfortable with him and felt his being able to use weapons to remove large threats would benefit my efforts greatly. This turns out to be a late game build mostly because there are generally a few turns of setup required to get things going. The most important part of this deck is really to set up draw engines as soon as possible this means on turn 3. The first go to option is Blood Frenzy. This will give you continuous draw throughout the remainder of the match which will be needed to fuel the resource renewal effect of the deck as well as help dig for key cards to support your board. The secondary draw engine is Tombstone Beacon. 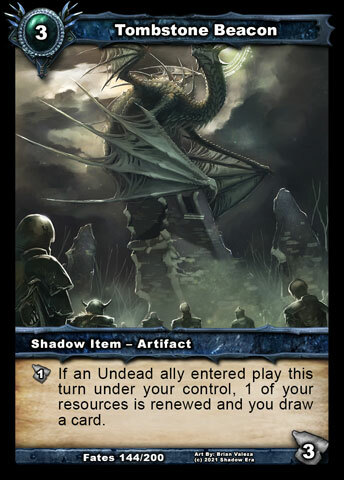 This helps feed additional drawing with the Undead Alignment and has a resource renewal feature which can be meaningful when combined with Jeweller’s Dream and Frostmare. 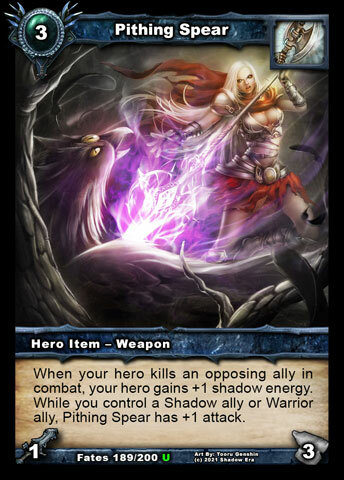 Complimentary Draw cards that support the build are Shadow Knight and Sacrificial Lamb. 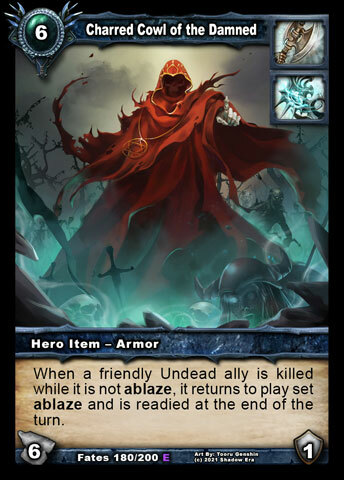 Corpse Hurler is an extremely strong ally when combined with Charred Cowl of the Damned. Essentially your opponent has to deal with a 6hp ally twice in order to completely remove him. This strength is further magnified by adding the Shadow Knight Loop for a very strong late game especially combined with the resource renewal of Tombstone Beach and Jeweller’s Dream. 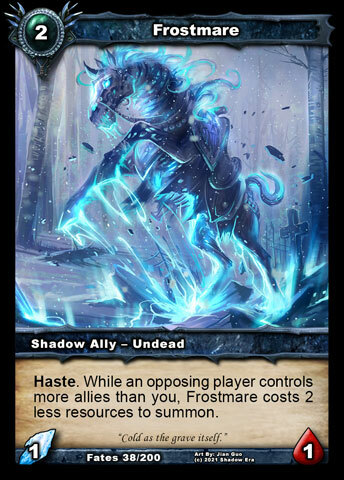 I’m testing Frostmare because he has good synergy with lots of cards. Pseudo cost emulates resource renewal which can benefit a turn 3 Tombstone for early draw. He can also be a good quick source target for Sacrificial Lamb though you only draw 2. He also is a quick source shadow buff for pithing spear. This build has a weakness to Item Destruction in general but most specifically Sorcerer of Edina and Rapacious Vermin. 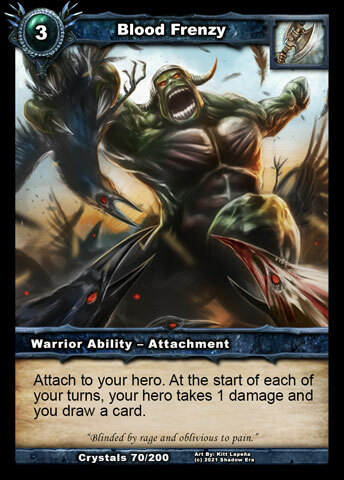 I am also not a huge fan of Crippling Blow (with Logan) as this increase opponent trigger point (SoE/RV) and they may also be running A Legend Rises so if you use Crippling Blows, I recommend proceeding to take down the allies and not leave them on the board. PLEASE NOTE: This is an article I wrote 4 months ago and hasn’t been played in about as much time. Current deck would look a little different probably something like but is currently untested in Quick Match. 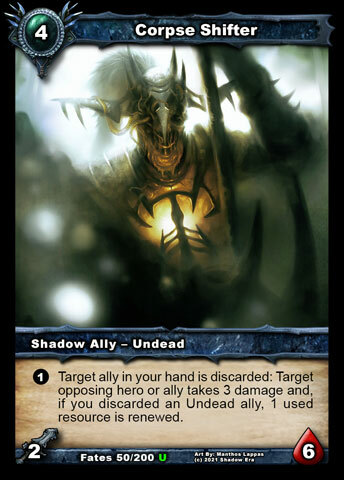 Tagged logan, Shadow era, shattered fates, Undead tribe.